I often like to switch up my handbag contents and each season I like to change up my bag too. 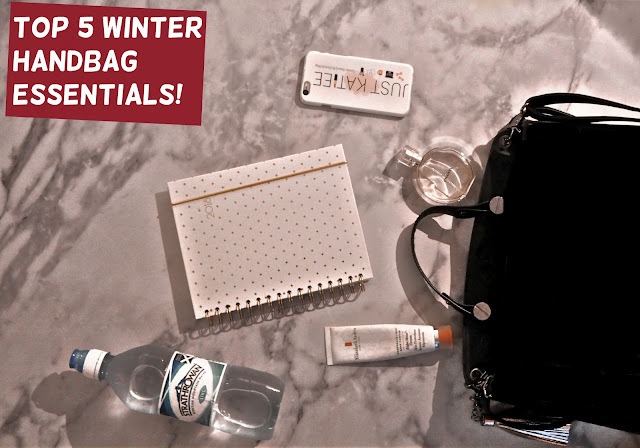 Now that we're nearing winter, I thought I'd share with you my top 5 winter handbag essentials. The bag I'm currently using is a medium sized satchel bag and I use it every day for work, shopping and out and about. I like the size as it is definitely a Mary Poppins kind of bag and fits way more than you think in it, however I wish it had different compartments because I have so much crap in there that it is often very difficult to find everything when it's at the bottom! Aside from that, it's a great bag and goes well with any outfit. I like to fit a lot in but today I'm going to share with you my top 5 handbag essentials. The first item on my essentials list, is of course, my iPhone. This is a given for me. I can't go a day without it (I know, sad!) but I use it on a daily basis for my blog, emails and social media. I love to listen to music on the way to work and I'm always scrolling Pintrest in my breaks too! My second essential is my Elizabeth Arden 8 Hour Cream. I am obsessed with this. I've reviewed this numerous times on my blog and I can't rave about it enough. It's my go to for dry sore lips and I sometimes use it on my dry skin on my face too. I can't live without it. My third item is my diary. I am an avid list writer. It's like a hobby; I have a list for the sake of a list (is anyone else like me?) My diary is from poundworld - would you believe it?! I think it's so pretty and I use it every single day for work, blog post ideas, social life etc. I couldn't be without a diary!! Another essential is a bottle of water because it's so important to stay hydrated! I find that during the winter I don't tend to drink as much water but I pop a bottle in my bag to try and force myself to drink more! My final essentials is a perfume. I tend to switch this up depending on which one I reach for in the mornings but I have been loving my Chanel Chance perfume recently. It's a floral, light fragrance and it's the perfect handbag size too!